There’s only one “badder” Cat than the 2016 ZR 8000 RR and that’s the turbocharged ZR 9000 four-stroker. For us and most serious performance riders, the ZR 8000 RR will be just about perfect. Yep, we liked this one. 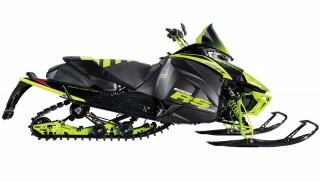 It’s got somewhere in the vicinity of 160 horsepower in a sled that weighs in the neighborhood of Ski-Doo’s MXZ X-RS (470 lbs) and the 2016 Polaris 800 Rush Pro-X (435 lbs) with similar performance. Figure that however you work the numbers, each horsepower propels less than three-pounds. There’s room for debate, especially by fans of the specific brands, but all in all these sleds are relatively equal when they tear down a groomed trail. Across a long, mirror smooth lakebed and you have reason to argue brand against brand. 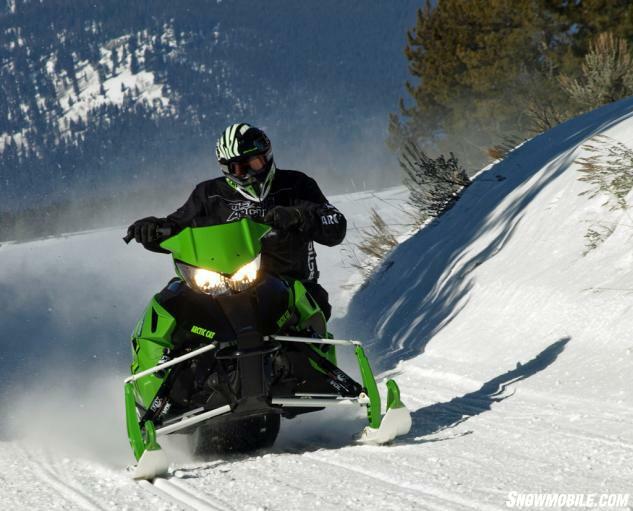 The RR’s Suzuki-built 8000-series 794cc, liquid-cooled two-stroke is well proven and has powered Cat’s 160 hp class sleds for many seasons now. Key attributes include its responsive, quick-to- rev nature; easy-starting batteryless EFI; the Arctic electronically coordinated power valve exhaust; and hot spark dual sparkplugs per cylinder. On the trail it fares very well in head-to-heads with the Ski-Doo 800 E-TEC and Polaris’ latest Cleanfire 800. We’re going to accept that these three sleds will be the primary choices for serious performance riders and that the knowledgeable Arctic Cat diehard will go for the ZR 8000 RR over the turbo 9000 version. We would because the 8000 RR will be lighter and less of a handful in the corners, plus about US$2000 less expensive. Setup on a sled is like location in real estate. It’s everything. Our test ride ZR 8000 RR was extremely well suited for us. It seemed to maximize the shock stroke without being either too harsh or too soft. After all, getting that sweet spot in the sled’s ride is what we try to achieve whenever we prepare a sled. The Cat crew got this right and we appreciated it. Of course, the RR comes with a premium shock package to control its 10 inches of front and 13.5 inches of rear travel. Up front you’ll have Fox Float EVOL RC remote-reservoir ski shocks, which are standard on all 2016 RR models. With the shocks’ extra air volume, you can expect improved dampening action for compression and rebound as you adjust the reservoir mounted clickers. With new reservoir-style Fox Evol “clicker” adjustable shocks for the front and rear suspensions, the 8000 RR becomes easy to tune for a perfectly rider-friendly ride. The familiar slide-action rear suspension adds a Fox Zero RC remote-reservoir shock to provide ride-tunable independent compression and rebound control. The Fox Zero C remote-reservoir front track shock offers compression adjustability only. Cat riders know that the tall spindle Arctic Race Suspension, common to ProCross models like the RR, combines those tall spindles with widely spaced A-arms to improve torsional rigidity and strength; exactly what sport riders need in rough trail sections. 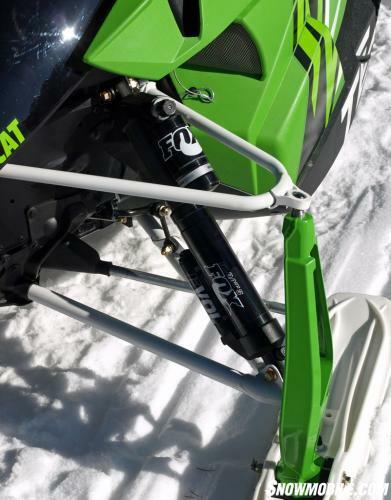 While the slide-action rear suspension may not have the fancy and hyped dials and knobs common to Ski-Doo’s rMotion or Polaris’ AXYS setups, the Cat design is equally unique. Cat’s Slide-Action suspension features a U-shaped slot that fits over a fixed shaft attached through the tunnel to allow a half-inch of sliding movement. This simple but efficient design results in giving the sled the full benefit of rear coupling with controlled ski lift during acceleration. The design incorporates Arctic Cat’s Torque-Sensing Link, which allows a lower and more consistent track tension; three-position rear coupling block adjustability; adjustable spring preload; and a fastened Tri-Hub rear axle assembly that’s lighter and more durable than two separate wheels. The rider’s-eye view of the RR is all business with a 5.5-inch fixed riser, curved handlebar, easy-to-read gauge and a hint of a windshield. Cat’s suspension story tends to take a back seat to the newer more gimmick-laden designs from Ski-Doo and Polaris, but we have become believers in the effectiveness of Cat’s Slide-Action design. Frankly, we like its seeming simplicity. With the use of the new reservoir and clicker-adjustable shocks, you are free to make more adjustments. We do know, that based on our test rides, the ZR 8000 RR can be set up for what we considered a near perfect ride. Of course, we will admit that our West Yellowstone ride course was not all that demanding overall, but in our favorite section of jiggle and stutter bumps, the RR ate them up from 30 mph to a quick accelerating 60 mph plus. We liked how the RR felt locked into the trail as we slipped into corners and powered out of them. We’ll admit to being tentative on our test trails, especially during the early morning rides. Trail conditions were hard, icy, and very slick. A serious push of the throttle on high performance sleds easily caused the track to break away. Thoughtful throttle was a must for some of us. But, after a few serious miles aboard the ZR 8000 RR, we didn’t want to give it up. Simply stated, we trusted the sled. Its 160 horsepower never seemed to catch us off guard. It was throttle-friendly. The 129-inch Ripsaw track only broke loose when we wanted it to. 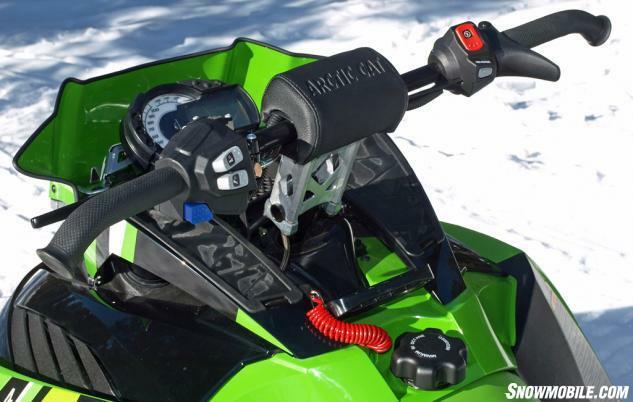 We credit the new for 2016 Arctic Cat drivetrain as being key to this sled’s rider-friendly performance. 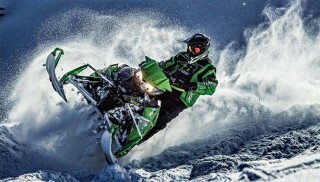 With a series of embarrassing clutch issues last season, especially on hard-ridden powder sleds, Arctic Cat turned to Minnesota-based TEAM Industries, a recognized OEM and aftermarket supplier of drivetrain components in the powersports industry. In business since 1967, TEAM enjoys a history of working with Arctic Cat as well as Polaris on driven clutches for both wheeled and tracked product lines. For 2016 you’ll find a major TEAM influence under the hood of virtually all Arctic Cat snowmobiles, ranging from TEAM drive and driven clutches on the RR to a new three-speed transmission featured on select 2016 Arctic Cat Pantera and Bearcat touring and utility models. For 2016 Arctic Cat partners with TEAM to offer a more durable and service-friendly clutch system. To change a belt with the BOSS driven sheave, simple insert the wrench, loosen and remove your drive belt. The 2016 8000 RR uses a TEAM Rapid Response drive and Rapid Reaction BOSS driven clutch combination. Arctic Cat claims, and we agree, that the drive setup provides smoother shifting. Combined with the quick revving Suzuki powerplant, we experienced very smooth and quick shifts. Only Cat buyers will know whether the new partnership backs up Cat’s claims of maximum durability and increased serviceability. The Cat-specified TEAM Rapid Reaction BOSS driven clutch features a “Built On Shaft Secondary” design. This means that the clutch is designed with machined sheaves that mount directly to the machined-matched driven shaft. 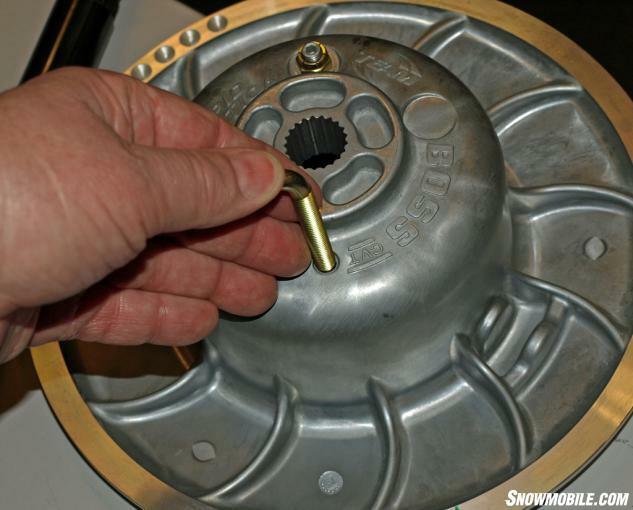 Specific to 2016 Arctic Cats, BOSS eliminates the need for a steel clutch post common to traditional designs. This is said to save weight, reduce rotating mass, improve clutch balance and achieve tighter clutch/shaft mounting tolerance. The 8000 RR corners flat and fast. When you look at the 2016 Arctic Cat ZR 8000 RR, it will appear very similar to the previous version. But, with the new premium shock packages and, especially, the drivetrain changes, we feel that the 2016 RR is greatly improved. 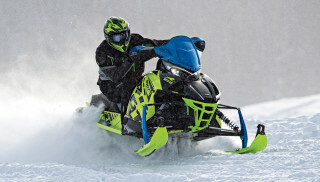 The sled is more tunable and rider-friendly, once you establish your perfect settings. The overall performance is smooth and quicker, at least from an in-the-saddle feel. And that’s all in addition to the extremely positive ride-ability you get from this Arctic Cat from its nicely curved handlebar, user-friendly gauge package, comfortable performance seating, and Cat-favored bright green in-your-face style. We could do with a taller windshield than the 5.5-inch height race screen, but you can add that. And, you can add storage gear and such, too. What you can’t add, but what you get standard is a sled that takes on all comers and all corners. Who would have thought that Arctic Cat’s 2016 ZR 8000 RR would be one of our top favorite sleds after a week of riding all manner of new-for-2016 models? Surely not us! But it was.